BCS Management and Maumee Rentals held their 2nd annual Maumee River Clean-up Day on Saturday, September 22nd. The event took place after being rescheduled from two weeks earlier due to weather conditions. We met at the Public Passageway, just past the dam at North Anthony Boulevard. Originally the event was going to include river clean-up with ground crews along the river bank as well as by canoe. Unfortunately canoes were not able to be provided due a transportation issue. We were excited to see that volunteers were just as happy to take to the greenway with trash bags and clean-up all alongside the river! There were plenty of plastic cans and bottles as usual, but also some odd discoveries. For example, someone found a locked safe off of the greenway. Not knowing what could be inside, they contacted the authorities! The police came and recovered the safe, but it turned out that there was nothing inside. Though it goes to show that you never know what you will find! 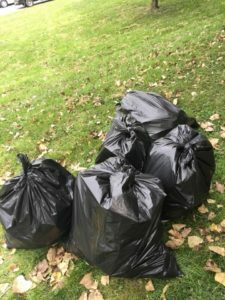 Last year during the Maumee River Clean-up Day event we found that there was so much garbage that we weren’t able to retrieve certain things. Some tires stuck deep in the mud and even larger items had to be left behind. However, this year we returned to some of the same spots and saw that many of the larger items left behind had been removed. Despite the rescheduling of our event on September 8th, many volunteers still showed up and took it upon themselves to clean up the area. Shout out to the APEX Consulting & Surveying team for leading the efforts that day! 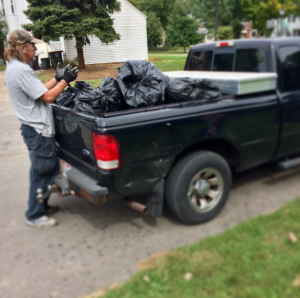 Even though the Maumee River Clean-up Day event lasted the same amount of time this year, there was significantly less waste found along the riverbank. It was encouraging to see evidence that Fort Wayne is increasing awareness about caring for our cities rivers. Thanks to everyone who volunteered, donated materials or spread awareness about river clean-up. We hope you can join us next year for this great event!